Optical fibers are ubiquitous, carrying light wherever it is needed. These glass tunnels are the high-speed railway of information transit, moving data at incredible speeds over tremendous distances. Fibers are also thin and flexible, so they can be immersed in many different environments, including the human body, where they are employed for illumination and imaging. Physicists use fibers, too, particularly those who study atomic physics and quantum information science. Aside from shuttling laser light around, fibers can be used to create light traps for super-chilled atoms. Captured atoms can interact more strongly with light, much more so than if they were moving freely. This rather artificial environment can be used to explore fundamental physics questions, such as how a single particle of light interacts with a single atom. But it may also assist with developing future hybrid atom-optical technologies. Now, researchers from the Joint Quantum Institute and the Army Research Laboratory have developed a fast-acting, non-invasive way to use fiber light to reveal information about fiber traps. This technique is reminiscent of biomedical and chemical sensors that use fibers to detect properties of nearby molecules. Fiber sensors are an attractive measurement tool because they can often extract information without totally disrupting interesting phenomena that may be going on. The research appeared as an Editor's Pick in the journal Optics Letters . The team also published a review article about optical nanoscale fibers in the most recent volume of Advances in Atomic, Molecular, and Optical Physics . Typical optical fibers, like the ones used in communications and medicine, have only a tiny amount of light near the outside surface, and that is not enough to capture atoms from a surrounding gas. Physicists can push more light to the outside by reshaping the fiber to look like a tiny hourglass instead of a tunnel. The waist of the hourglass is hundreds of nanometers, a few times the width of a human hair and too small to contain light waves that are propagating along the inside of the fiber. But instead of just stopping at the constriction, the light squeezes to the outside surface. When physicists inject light into both ends of such a fiber, the light waves combine together to form a stationary ripple around the constriction. Atoms will be attracted to dips in the wave and line up like a row of eggs in a carton. This trapping is an example of how light affects atoms, drawing them in. But the light-atom relationship is reciprocal: The presence of atoms can alter the light, too. 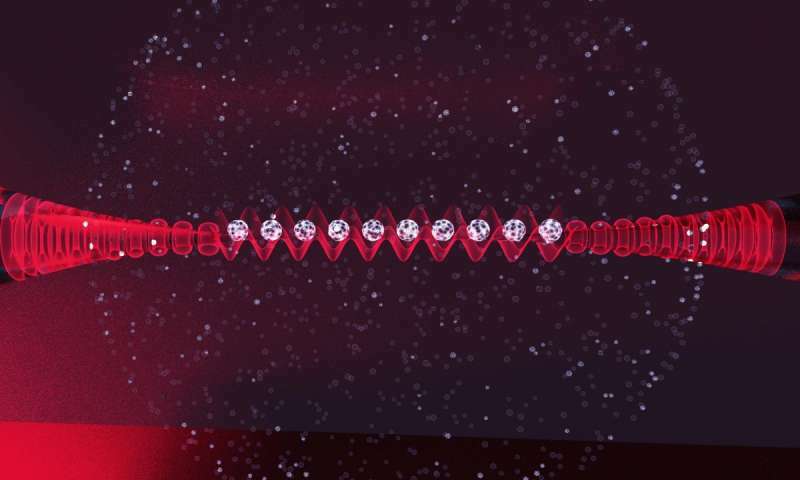 Light waves, sent into one end of a nanoscale fiber, will pick-up information about the atoms in the vicinity of the fiber, and then convey it to a detector at the opposite end of the fiber. Each trapped atom acts like a marble in a glass bowl. When pushed, a marble will roll up the side of the bowl, back down, and then up the other side. The speed of this cycle is related to the bowl's curvature: Steeper walls cause faster cycles. Now imagine shining a flashlight through one side of the bowl. As it goes back and forth the marble will keep passing through the flashlight beam. The beam signal will blink on and off at the rate at which the marble was moving in the bowl. In other words, the information about the marble motion, and therefore the bowl's shape, is encoded onto the flashlight beam. In this research, the team uses laser light as the probe, analogous to the flashlight. A mere 70 nanowatts in power is injected into the fiber, gently kicking the atoms into motion. Similar to marble wobbles, the atoms rock back and forth in their bowl traps. Instead of causing the probe light to blink on and off, the atom motion affects the direction that the light waves oscillate. The speed of the atom rocking, which is directly related to the atom trap shape, will be imprinted on the light as faster or slower changes. When the light waves complete their journey and exit the fiber, the team catches them with a detector to continuously monitor the atom-light oscillations. The process is fast, taking only a fraction of a millisecond, and it can be seamlessly integrated into an experimental sequence. When it comes to measuring these atom trap properties, physicists want to avoid disturbances. This can be difficult to do because one of the most effective ways to probe atoms involves blasting them with light, which can heat and even release them from their traps. This conventional method is acceptable because scientists can just recool and recapture the atoms. In contrast, the JQI-ARL technique uses very little light and is done in-situ, meaning it collects information while minimizing disruptions. This appealing alternative promises to streamline atom-fiber experiments.